As we are involved in offering our customers different types of automobile component, we are also offering an extensive range of Wheel Nuts & Washers for Light & Heavy Vehicles. 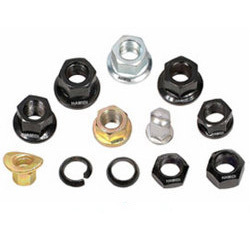 These dome shaped nuts and washers are widely applicable in different areas and industries for various applications. These products are applied for the wheel assemblies and loading in axle. Our range of wheel nuts and washers is available in different sizes and specifications. We are counted among the prominent firms engaged in manufacturing, supplying and exporting of Automobile Components, Industrial Fasteners, Tractor Parts and Railway Track Fasteners. Wide array of products offered by us are Wheel Assemblies, Wheel Bolts for LMV, Wheel Studs for Heavy Truck & Trailers. We manufacture the products in order to meet the varied needs of customers in best possible manner. Material of high grade is used by us in manufacturing process, so that any problem due to bad quality products would be avoided and customers would be able to enjoy the hassle free performance at their end. We customize our range in accordance with the customers needs and demands and ensure that they may get desired results out of them.